Do You Really Need Private Health Insurance? According to Canstar, based on the latest available figures from the end of 2017, 45.6% of Australians have a private health insurance policy that will cover hospital treatment. This was a slight drop from the 46% that Canstar reported based on figures from September 2017. In real numerical terms, this equated to around 12,000 fewer Australians who were covered. Is Australia Falling Out of Love with Private Health Insurance? Due to the mixed delivery of Australia’s healthcare services across the public and private sectors – and the varying degree to which Medicare will cover different medical costs – private health insurance in Australia is far more popular than it is in other countries across the world. The Finder comparison website allows consumers to search for health insurance that is tailored specifically to their needs, while at the same time highlighting the average cost across Australia as well as some of the huge fluctuations that can occur depending on where you live. Finder reports that the average cost of health insurance in Australia was $166 per month ($1,992 per year) in 2018 for a hospital policy. At state level, health insurance in the Northern Territory for a hospital policy was the cheapest on average, at $131.85 per month, and also offers the cheapest monthly “extras” premium at $6.27. Victoria was the most expensive state on average for a hospital policy, coming in at $193.73 per month. While Australians may be increasingly thinking about their personal bottom line and saving money by not renewing their policies, these are cheap compared to some of the most expensive policies! The priciest insurance on the Finder website comes in at a staggering $1,152.75 per month, and that’s for single person cover! What do the Different Types of Health Insurance Mean? Hospital Only cover will typically get you a room in a hospital, and in some cases cover pre-existing ailments and non-cosmetic plastic surgery. Extras Only cover will cover the costs of certain treatments up to a certain cost. Typically, your extras cover can cover you for dental and physiotherapy costs, while others may also include psychological treatment, the cost of chiropractic treatment, and optical costs. Depending on the private health insurer, you may choose an insurance that covers the cost of an ambulance. Hospital & Extras cover combines the two, covering as many bases as possible with regards to your healthcare. On top of these specific types of health insurance, you can also take out policies as a single, a couple, a family, or as a single parent to cover yourself and your children. Is Your Health Insurance Policy Really Worth It? Every health insurance policy will be different. For example, within hospital cover, some insurers will guarantee you a private room at a private hospital, while others may provide you a shared room in a public hospital. In some cases, the cost for these policies won’t be significantly different, despite one feature appearing to be far more attractive than the other, and you’d get a room in a public hospital under Medicare anyway. You should definitely be wary of paying extra for something that you’re already entitled to! 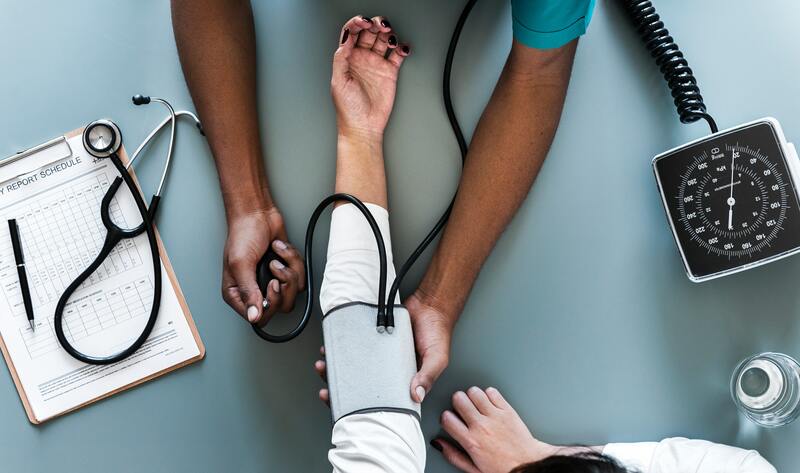 With so many different variables, it is difficult to outright say whether your health insurance policy is worth it, as it really depends on your specific policy that you have taken out and what you get with it. As much as it is difficult to assess the true value of hospital cover, it’s easier to do so when it comes to extras cover. When shopping around, renewing, or considering cancelling your health insurance, taking a close look at the extras is often where you can discover you’re wasting a lot of money. Health insurance extras policies almost always have an annual limit attached to the different types of treatment. For example, looking through the Finder website again, it is possible to find extras policies – and these aren’t just a minority of them – where you can pay in excess of $600 a year for cover but the annual limits of some treatments might only be $300. Granted, if you need to access various treatments, you may get better value. However, if you’re paying over $600 a year for insurance cover, you might expect that if you were to get a dental bill totalling $600 that you’d be covered for all of it, and not have to pay another $200 – $300 on top to cover the full cost. After all, if you take out a comprehensive car insurance policy and you lose your car in an accident through no fault of your own, the car insurance covers the cost of a replacement, right? Will You Actually Use Your Health Insurance? What’s the Alternative to a Policy? Given what we now know about how you might not be covered for the full cost of treatment with an extras policy, it pays to think about the likelihood of you ever using any policy you may take out. The old argument with any insurance is that “it’s better to have it and not need it than not have it and need it”, but given that private health insurance is not a mandatory requirement, you might consider a separate standalone hospital cover or extras cover, or choose to switch to a starter cover in order to save the additional amount you may have to pay out-of-pocket each month. By saving even $100 a month towards future medical costs, you’ll have a significant sum to spend should you need it. If you never use it, you’ll at least have the money to spend on yourself and your family, rather than having used it to pay for something you’ve never used and achieved little other than helping the insurers to make a tidy profit from your policy! Do you know when a credit check is done? In the majority of cases, a credit check would only be done with your consent, but are you agreeing to a credit check being done without realising? Do you understand the impact of making a credit application and what it could mean to your credit history and score? A study conducted by NOW FINANCE revealed that 40% of consumers who have taken out a loan in the past five years had no idea whether or not a credit check was done when they made an enquiry. When is a Credit Check Actually Done? There are numerous occasions when a credit check might be conducted. In general, when you apply for credit, lenders are looking to understand whether you are likely to be a reliable borrower. At present, this means they’ll see your credit score, and whether you have any defaults or other credit infringements. With Comprehensive Credit Reporting (CCR) that has been made mandatory for the big 4 banks and optional for other finance providers since July 1 2018, lenders have access to much more information related to your credit use and behaviour than ever before. Utilities providers may also check your credit score prior to offering you specific account options. It is important to understand that the credit check is generally completed the moment you apply. If you give a lender a call to discuss a loan, for example, then you won’t be credit checked. If you ever deal with a broker to help you find a finance product, they will usually not conduct a full credit check, but if they intend to, they must have you sign a Privacy Consent form specific to making an enquiry on your credit file. What Impact Does a Credit Check Have? Every time a credit check is conducted, it influences your credit score. In many cases, the credit check will have a negative influence. Each of Australia’s credit reporting bureaus uses an algorithm to generate your credit score, and a credit check will influence the algorithm and thus your score. Depending on how the specific credit bureau calculates your score, and the weighting given to credit checks within the algorithm, will depend to what extent your score reduces. Not every credit check will have an equal influence. If you apply for a personal loan today, for example, this application and check, in isolation, will only have a negligible impact on your credit score. If you then apply for another credit product in nine months’ time, then again the impact is likely to be small. However, if you apply for a personal loan today, a credit card tomorrow, store finance next week, and another loan by the end of the month, this will have a hugely negative impact on your credit score. Having multiple applications for credit on your credit report is a common sign of financial distress. As such, in the eyes of a lender you may appear to be more of a financial risk. As a result, if you are looking for a personal loan or a credit card, it pays to check your credit report – which you are entitled to do at no cost – and to ensure all the information held is correct, before applying. It is common for people who need a personal loan or another credit product to continue applying following a first decline, which only makes their chances of being accepted lower. What Does This Impact Mean for You? How can having excessive credit enquiries on your credit report impact you? As it reduces your credit score, you could find yourself being declined for credit. Even when you are accepted for credit, you may find that you are only offered higher interest rates given that you are perceived to be a higher risk. CCR participating lenders are able to see all your recent applications for credit as well as your credit score, so be sure to only apply for credit when you need it. Some lenders, including NOW FINANCE, offer you the opportunity to get your interest rate and tell you whether you qualify for a personal loan prior to a credit check being made. Such opportunities are great for consumers, as you can enjoy the transparency of knowing what your interest rate will be before you apply for a loan and prior to a credit check being conducted. You also avoid situations where you might see an advert for a personal loan and be attracted by a low interest rate being advertised, only to be offered a higher rate once accepted and feel like you have no choice but to accept. When you definitely need credit. When you have checked your credit file and are happy that everything that credit bureaus will see is correct. Ensure you are always aware when a credit check will be completed, and where you can use lenders and credit providers who will tell you your interest rate before you apply. Unless you’re in the habit of changing your car every few years as standard – or keep getting offered amazing finance deals to do so – you will probably have experienced the “fix it or replace it?” conundrum. It’s when you find yourself with a hefty car repair bill, and you ask yourself whether you’d be better off in the long-run buying a new car as opposed to paying for the required repairs. When are You Faced with this Question? There are usually two paths that take you into this scenario. Your car is fairly new – or if it’s a used car you’ve recently bought it – and you’re already encountering regular problems and needing to take trips to the garage. You’ve owned your car for many years. Although you’ve taken care to look after it, signs of age are starting to show and regular servicing and repairs are starting to add up. Whether you ultimately decide to fix your car, or sell it and get a new one, will depend on your circumstances. What considerations do you need to make that will help you decide the best way to proceed? Buying a new car is a great feeling, but it isn’t always a simple process. You need to find the money to buy a new car. You need to change your car insurance. If your employer covers you for business travel you need to inform them and potentially complete even more paperwork. Getting your car fixed will often be quicker than going through the process of buying a new one. A mechanic reporting a fault should also be able to give you a quote and timeframe for the necessary repair. In some cases, repairs will be able to be done the same or the next day. If the fault isn’t a major one and the car is still driveable, a repair can be done at your convenience. Spend a few hundred dollars, fix the problem, and get back on the road. Is a Repair Just Kicking the Can Down the Road? Paying $1,000 to get your car repaired now might not be a big deal. It might become a problem if you’re spending $1,000 today, another $1,000 in six months, then the same amount again a few months later. What happens if you spend that $3,000 on quick fixes over the course of a year and then find out you need a new car anyway? Car repairs are not all created equal. You might get a repair bill of $500. Equally, if you need a new engine or something equally as serious, you could easily be looking at a bill of at least $2,000, and maybe significantly more. At what point does it become more cost effective for you to buy a new car rather than continue putting money into your current vehicle? When you buy a new car, it comes with a warranty from the manufacturer. Kia currently offer the longest warranty in Australia, at seven years, with unlimited kilometres. Ssang Yong also offers a seven-year warranty, but only up to 150,000 kilometres. It was reported last year that Kia is even considering extending this to 10 years should more competitors match them at seven years with unlimited kilometres. You don’t need us to work it out for you. If you buy a new car with a great warranty, and do your bit in terms of looking after the vehicle, you’ll never pay for car repairs again! The technology used in the manufacture of cars is continually evolving. Every time you see an advertisement for a new car you’re probably being told about the latest safety features, or how it offers even more in comfort and convenience than the previous model. When you buy a new car you get the latest in safety features, comfort, and convenience. Combined with your warranty, you can drive your new car with the peace of mind that you’re in a safe place but also covered in the event that anything does go wrong. The average cost of a new car in Australia is $28,000 (Retrieved from https://www.moneysmart.gov.au/life-events-and-you/life-events/buying-a-car/car-buying-in-australia). It would be highly unusual to receive a repair bill of that size for your car. However, as we saw earlier, regular car repairs can quickly add up, so it’s a judgment call for yourself at what point buying a new car starts to make more sense than repairing your current vehicle. You also need to sort out your insurance, potential employer paperwork, and the dreaded family politics. What’s the best solution for your circumstances? At NOW FINANCE, we understand that it might not always be as easy as choosing between a repair and selling your car to buy a new one. We also know that you might have little choice but to pay for repairs, but need to find the cash to get these done. Whether you need cash to cover the cost of repairs, or to help you to buy a new car, we may be able to assist you. We offer personal loans for the purpose of covering car repair costs as well as for buying a new car, at an interest rate that reflects your credit history and financial behaviour. Get your rate before you apply for your loan, with no impact on your credit score or obligation to proceed if you’re unhappy with the rate offered. When you visit our website or receive an email from us, you might have noticed the section that talks about and displays our TrustPilot rating. What is this? How does it work? Why should you trust it? TrustPilot is a consumer review website. Founded in Denmark in 2007, it now hosts reviews from businesses all across the world, including NOW FINANCE. TrustPilot allows customers of a business to review on its website. TrustPilot works for businesses, too. While companies do not have to pay to use TrustPilot, by doing so they can take advantage of specific features such as the ability to feature their TrustPilot reviews on their website, as we do on our homepage and across some other pages. How Does TrustPilot Generate Its Ratings? TrustPilot generates its ratings both by allowing users to add ratings and by emailing customers of companies to ask them to leave a review. For example, if you take out a personal loan from NOW FINANCE, a short time after the funds have been transferred into your bank account, you will be invited via TrustPilot to complete a review of the service you have received and your experience of dealing with us. What are You Asked for? Completing a TrustPilot review is simple. Provide a star rating out of five, from “1 – Bad” to “5 – Excellent”. Give a short, written review of your experience dealing with the company in question. Finally, verify your identity (to ensure the review is genuine) via Facebook, Google, or your email address. Once you have completed this, you review will be added to the page of the company in question, and built into their aggregate rating. Aggregate ratings are calculated as an average. For example, if one customer leaves a “1 – Bad” rating, and another leaves a “5 – Excellent” rating, the overall rating for the business will be “3 – Average”. Over time, a company’s overall TrustPilot rating will evolve as it collects a higher number of reviews. With numerous pieces of research highlighting that often over 90% of people look at online reviews before making a purchase decision, TrustPilot’s model enables consumers to have confidence in using their reviews to aid their decision making. If a company has thousands of reviews and an overall rating of “5 – Excellent”, you can put your trust in that business delivering an exceptional service or product. Likewise, if a company has thousands of reviews and is rated overall at “3 – Average” or below, that’s a sign that you may wish to look at a different option. One benefit of being able to see the reviews on TrustPilot’s website is that you can gauge the current performance of a company. For example, in the examples above, the “5 – Excellent” company might have lots of recent reviews saying “1 – Poor” or “2 – Bad”, while the “3 – Average” company might have recent reviews saying “4 – Great” and “5 – Excellent”. Use the overall rating as a guide, but remember to look at what’s been said most recently, too. TrustPilot invests a lot of time and effort into maintaining the integrity of its reviews. While having to verify identity aims to reduce the chances of anyone posting fake reviews, TrustPilot acknowledges that some companies may choose to create multiple email addresses in order to write reviews and falsely inflate their overall rating. In addition to this, TrustPilot labels reviews from people they know are customers – because they’ve emailed them following a sale – as “Verified Order”, so you can see for yourself which reviews have definitely been left by genuine customers. Although a company may have a genuine reason for having a larger number of unverified orders manually submitted – for example if they only have a free TrustPilot account – you can enjoy added confidence in your purchase by buying from those with a “5 – Excellent” rating and the majority of reviews are marked as a “Verified Order”. What is NOW FINANCE’s TrustPilot Rating? We’re currently rated as “5 – Excellent” based on over 800 customer reviews, the vast majority of which are Verified Orders. You can view our most recent reviews in the TrustPilot section on our homepage, or by clicking through to our TrustPilot page. With NOW FINANCE, you can get your rate before you apply for a personal loan, with no impact on your credit score, and no obligation to proceed to a full application if you’re not satisfied with the rate you’re offered. Apply today to see why our customers rate us as excellent! When do Personal Loan Providers Check Your Credit File? Understanding when personal loan providers check your credit file will help you adapt your behaviour when shopping around for personal loans, as well as other types of credit products. Let’s take a look at when personal loan providers check your credit file, and what you can do to protect your credit score. When you apply for a personal loan, the lender will check your credit file, logging a credit search and thus potentially impacting your credit score. This means that the lender has looked at your credit file and potentially impacted your credit score before they tell you what interest rate they are going to offer you, should they approve your personal loan application. As a consumer, this is not an ideal situation, as you might get offered an interest rate that is higher than what you expected or saw advertised. The interest rate could also take the loan out of your range of affordability. While you don’t want this particular loan and want to keep looking for better options, you might be worried that having multiple inquiries on your credit report can lower your credit score leading to a higher interest rate offered by another lender. The best thing to do is to ask lenders about your interest rate before applying. If you have been targeted with direct marketing, such as an email or a text message that mentions a specific interest rate, ask them if you’re guaranteed to get that rate, or if it is likely to increase. When you are unable to get a fixed interest rate – after all, we know that many lenders will say they’re unable to tell you anything until you apply and they check your credit file – you should at least be able to get the range of interest rates that you may be offered. When you’re not given a range of interest rates, but are told your interest rate will be “From” a low number. When the range of interest rates being offered is wide. For example, 7.95% – 47.95% is a wide range of interest rates, whereas 7.95% to 17.95% is a narrow range. Another option you have is to check your credit file and get your credit score yourself. Once you are armed with this information you can always try to find out what your interest rate will be by asking lenders, although again you may be limited with what you are able to find out. As we’ve already discussed, you may struggle to get an idea of your interest rate before you apply for a loan. Many lenders will simply say “You need to apply” and leave it there. With NOW FINANCE, you can check your guaranteed rate upfront before submitting an application, without impacting your credit score or leaving an enquiry on your credit file. This happens by conducting what is called an “Access Seeker” check, which allows us to get your credit score and give you a personalised interest rate based on your financial behaviour. You then know exactly what your loan will cost, and can make a decision on whether it is affordable for you. This interest rate won’t change throughout your personal loan application. If you apply for a loan and are accepted, that is the rate you will get. If you decide that the interest rate isn’t for you, you are under no obligation to apply for the loan and can walk away, with no impact to your credit score or search logged on your credit file. We believe that it’s best for you as a consumer to know what you’re applying for before you decide to go ahead. When applying for a personal loan, it pays to do your homework before you apply. If you ultimately decide not to apply for a NOW FINANCE personal loan after you have got your interest rate, follow the guidance we’ve provided throughout this article and elsewhere across our blog to ensure you are offered a loan that is best suited to your circumstances. Refinancing a personal loan may be a great financial solution that could bring many benefits. Refinancing is simply taking out a new loan to repay the last one, and is usually done to consolidate liabilities which may reduce the number of repayments being made or to be able to borrow more. Why might refinancing be a good idea? You can take advantage of better loan features. This may mean a better interest rate, reduced repayments, more time to repay the loan, or extra capital to get those things you want, now. You can consolidate your existing debts to save money. This may mean you become debt free quicker, and reduce the overall amount you will repay. If you’re currently considering refinancing a personal loan or other debts, we’ve broken down the process into 5 steps. Follow these steps and you may increase your chances of being successful when applying for a new personal loan, and also ensure that you make the right decision based on your own financial circumstances. One of the most common reasons people look to refinance personal loans and debt in general is that their credit score has improved, meaning they can refinance with a better interest rate than previously, thus reducing their repayments. Check your credit file – you are entitled to check it free – and ensure the information held is accurate. You should also work to improve your credit rating. With the introduction of Comprehensive Credit Reporting (CCR) in Australia, it is now easier for consumers to highlight that they are a reliable borrower. The Big Four banks are legislated to share positive reporting information, while many other banks and non-bank lenders including NOW FINANCE have voluntarily opted in. This means prospective lenders can see evidence of you making repayments to your accounts on time, as opposed to in the past when lenders could only see negative aspects of your credit file such as missed payments or other credit infringements. If you manage your use of finance, limit your exposure to debt and the use of your credit cards, and ensure you make all payments on time, you may increase the chances of improving your credit score and may enable you to access a better deal when it comes to refinancing. Don’t compare personal loan deals by “shopping around” and applying for many different loans to see what you are offered. This is a sure-fire way to negatively impact your credit file and score, and will likely lead to you being offered only very uncompetitive personal loan deals or even being declined outright. Instead, spend some time looking around personal loan providers and see what’s on offer. If you have a “wish list” of specific features you want to see in your personal loan, such as a lower interest rate, lower on-going or exit fees, then keep this in mind as it will help you to eliminate any lenders that don’t meet your preferred criteria. If you have a great credit score and a very positive credit history, it may be the case that you will get a better personal loan deal by borrowing from a non-bank lender. As we noted earlier and looked at extensively in our previous article on refinancing, one of the main reasons people choose to refinance is because they want to save money. While refinancing could look like it is saving you money in the short-term, for example by reducing your regular debt repayment, it could still end up costing you more. Exit or early termination fees, should you wish to pay out your loan prior to the end date*. Ensure you check these with each lender, as what could initially seem like a great deal to help you refinance can easily end up costing you far more than you think. Having checked your credit file and potentially taken some time to rectify any errors or improve your credit score, compared personal loan deals, and considered the full costs of refinancing, you’re now in a position to make a decision on whether you wish to proceed. While it is recommended that you don’t apply for any personal loans yet – remember what we said about the impact this can have on your credit score – you should have a great idea of which lenders are likely to be able to provide you with the best deal. If you are interested in NOW FINANCE personal loans, you can get your personalised interest rate before you apply to get visibility on what your repayments will be, with no impact on your credit score and no obligation to proceed to a full application. Once you have used your new personal loan to repay your old loan or to clear previous debts, make sure that all of the balances are zero and that your old lenders have closed your accounts. This will ensure you avoid any additional fees and don’t receive any further statements regarding your account. At NOW FINANCE, we understand that everyone is different, therefore different loan solutions may be suitable for you depending on your circumstances. Our personal loan specialists are committed to ensuring they find the best possible solution for you. If you are looking to refinance an existing NOW FINANCE personal loan, a loan from another lender, or other debts, we can help you. You can get your rate here with no impact on your credit score, and then proceed with your application if you’re happy with the rate you’ve been offered. Contact us on 1300 275 669 to speak with one of our Australia-based personal loan advisors to discuss your needs and get started with your loan application. Chat to us via our live chat functionality and request a call back from one of our advisors, or fill out the form on our Contact Us page. Refinancing your personal loan and enjoying the benefits of doing so could be just around the corner. Follow the steps in this guide to help yourself to understand if refinancing is for you, and get in touch with us as soon as you’re ready to proceed with your NOW FINANCE personal loan application. * NOW FINANCE have not charged exit or early termination fees since June 3rd, 2018. Ever Considered a Career in Finance? Trust us, it’s Definitely not as Dull as It sounds! Whether you’re currently finishing up high school and aren’t sure what your next move is going to be, are in your final year at university, or are considering a career change, the finance industry could be an opportunity that you’ll find fun, interesting, and personally rewarding. 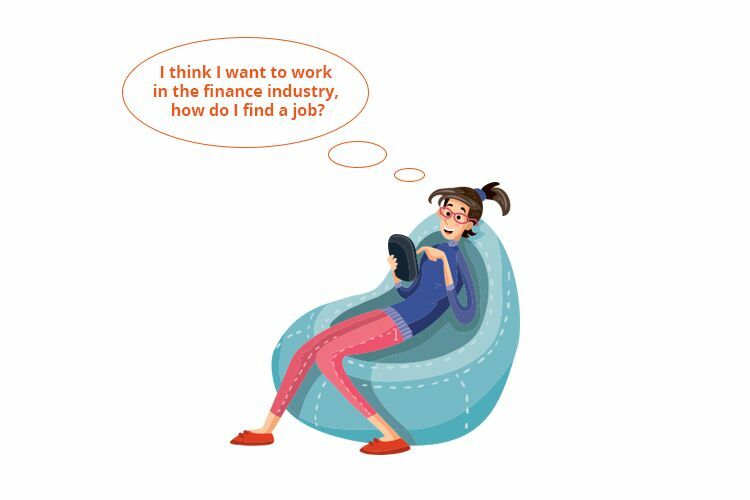 Now, we know that finance doesn’t always seem the most glamorous and exciting choice, particularly if you’re currently in a job you already don’t enjoy. What we aim to do in this article is to highlight the different opportunities that may be available to you in the finance industry, and why these jobs could be much more than what they may seem from the outside. What Different Types of Jobs Are Available? What type of job do you want to do? 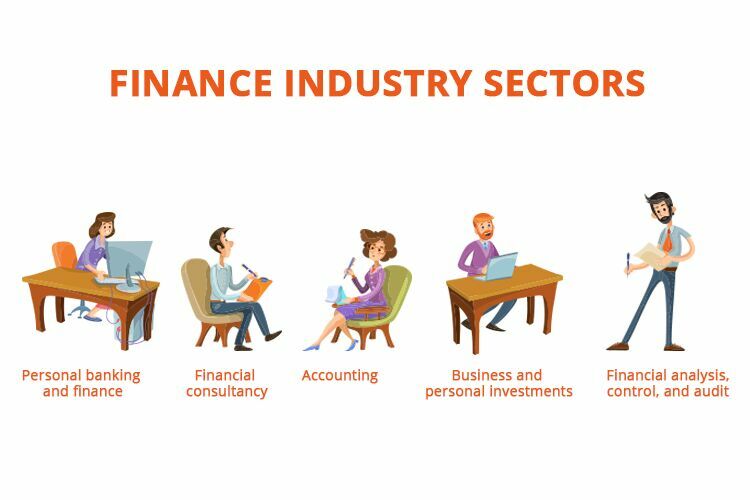 Which specific sector of the finance industry are you interested in working in? 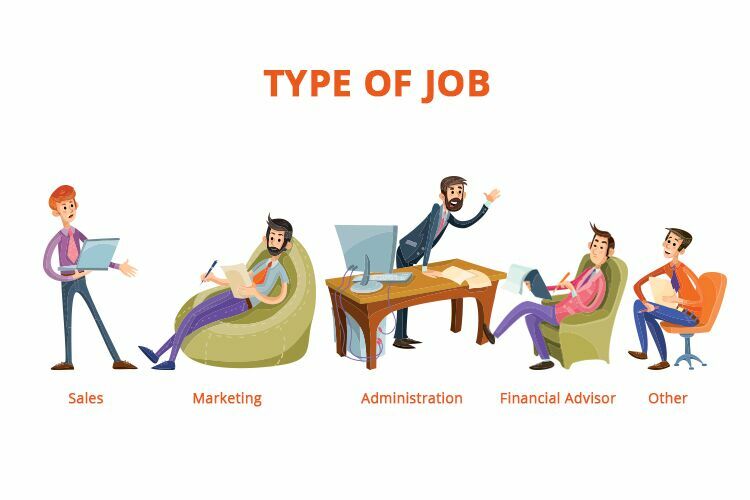 What do You Mean by “Type of Job”? By this we mean the specific job role. For example, do you want to work in sales, marketing, administration, as an advisor, or is there something else you’re interested in and good at that you could bring to the finance industry? What Sector Should You Choose? Whether you’re a salesperson, a marketer, or whatever job and role you specialise in, there’s still another decision to make. There are companies across Australia that specialise in all of these, but many of the bigger banks and other finance businesses will have opportunities for you to do any or all of these. The main thing about the finance industry that, whatever position and niche you find yourself in, you have a real opportunity to make a difference to people’s lives. Thinking about the types of jobs and sectors we thought about earlier, how might each role help you to make a difference to someone through your work in the finance industry? As someone who works in sales, you will have the opportunity to meet lots of people and highlight how the company you work for could help them. For example, if you were selling a NOW FINANCE personal loan you could find yourself explaining to someone how a NOW FINANCE personal loan could help them get what they want in life, and the benefits of our product and customer service. In a marketing role, you might design a billboard that millions of people are going to see, take part in putting together a campaign for television advertising, or work on writing emails to potential customers who may have forgotten about their loan application. A marketing job could be your opportunity to introduce someone to a financial product or service that could change their life. As a financial advisor or consultant you may interact with a variety of finance products and services and become very knowledgeable about the industry as a whole. With the unique insight you will acquire through experience, you could spend your career helping people to make sound financial decisions. Who knows what your advice could help people to achieve? If you choose to pursue a career as a financial analyst, you could make a difference to thousands of people at a time if you were working in a business. Highlighting what your company is doing well, as well as where there are opportunities to make improvements, could mean people get pay rises, bigger bonuses, or that the company is able to grow and recruit even more people. All because of your work! What do we do at NOW FINANCE? Although at NOW FINANCE we provide personal loans to individuals in Australia, we also work closely with businesses who sell products and services related to the loans we provide. So, if you were interested in working for NOW FINANCE, you wouldn’t necessarily only be able to become one of our personal loans specialists. You could join our team of people that works with our business affiliates and partners where you will help to grow their business as well as ours, work in our marketing team, or get involved with our credit checking procedures. If you’re interested in working in the finance industry, why not start your job search now? If you’re still in education there may be opportunities such as work placements and internships available, and often you’ll find doing these makes it easier to get employed in the industry, whether or not you end up at the same company, when you’re moving into full-time employment. For those currently employed and perhaps considering a career change, simply think about your existing skills and how you can transfer them to the finance sector. Alternatively, you may wish to consider undergoing some training or a further education course to increase your skillset and enhance your value to any potential employer. Perhaps most importantly, don’t ever feel, just because your degree wasn’t in a finance subject or you don’t currently work in the finance industry, that such jobs aren’t open and available to you. Companies across the sector need a wide variety of skills and often people entering a completely new job or sector are the ones who are the most open to learning new things as well as the ones who bring more in terms of new ideas. If a job in the finance sector appeals to you, start looking today and find yourself a fun, interesting, and rewarding career path. Whether you rent or own your property, modern property prices mean that sometimes we’ll find ourselves living in small spaces. While for some of us that might mean renting a room or sharing with friends, some of us are able to afford a place of our own, though in some cases this means living in a small studio apartment, or something similar. Living in a small space can be great fun, and it’s only really people who have always lived in larger surroundings that don’t understand this. From keeping the space tidy to decorating the interior, living in a small space forces you to be creative, often with inspirational results. 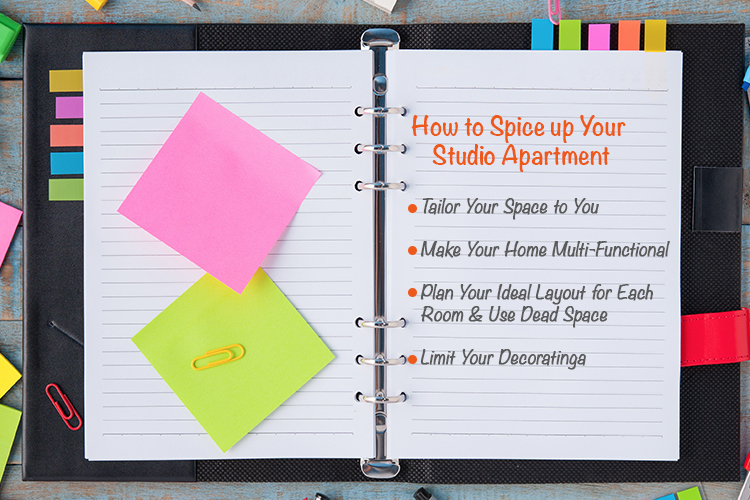 While a trip to IKEA or your local DIY store will give you plenty of ideas for having your whole home in a small space, you can get started in spicing up your studio apartment or equivalent with these great tips. A common example of wasted space in small properties comes in kitchens, particularly if it’s a home inhabited by a professional who often eats out or picks up dinner on the way home. Often, small apartments and similar properties will have extensive worktops or storage units that have barely anything in them. If you’re someone who barely cooks, hardly ever has guests around, and never does a big grocery shop, why have the units taking up space when you’re not using them? You could even save double the space if you can remove lower level units and use the space for your washing machine and fridge! Think about how you live and your lifestyle, and tailor your interior to you, rather than filling each room with furniture and fittings you aren’t going to use very much. There’s a big movement within interior design at the moment to ensure that each part of the home has its own distinct and clear use. However, this doesn’t mean that you can’t be multi-functional at the same time. If you’re living in a small space, taking advantage of multi-functional living opportunities is key to maximising the potential of your home. Depending on the layout of your apartment, this may mean having a unit which breaks up an open plan kitchen and living space, but that acts both as your kitchen table, and then as a study area on the living room side, with the space beneath being used for storage. In your bedroom, having a raised bed gives you all the floor space of your room to work with, ideal if you take one look at your room and have no idea how you would ordinarily fit in a double or king size bed, a dresser and wardrobe. If you’re currently in the market for a property to buy or rent and you’re looking at smaller spaces, seek out en-suite bathrooms, as the space saved by having a standalone bathroom usually means you’re getting more living space for your dollars. Plan your ideal layout for each room without taking any storage needs into account. Once you have done this, take a look at where the dead and redundant space in your room is, and then resolve to use this as storage space. For some small properties, there will be alcoves within rooms that make it obvious where your storage spaces are going to be – a sofa can’t fit in a metre of space, after all! For others, some rooms may have unusual shapes that will make this harder to do, but by considering what essentials you need in each room first, you will avoid planning storage space that has convenience but no aesthetic appeal to your room. You’ll also find yourself being far more organised, and may even be forced into having a clear out if you’ve had a tendency to hoard in the past! Remember that dead space doesn’t need to be from floor to ceiling. If you don’t have pictures on the wall, then shelving above the television or your sofa – particularly if you have decorative items you wish to display – works brilliantly too. When you live in a small space it’s easy to go overboard on the decorating. However, the best thing to do to maximise a small space is the exact opposite. Limit your use of patterns and colours, and if you use a pattern as well as a block colour, make sure they complement each other brilliantly. Plan your decorating around things such as feature walls so there’s a focal point for each room. For example, the main wall in your living space might be wallpapered with a distinct pattern, while the rest of the room is painted in a light shade of a colour found within the wallpaper pattern. Try to avoid decorating with darker block colours. The room will look strong and distinct, but your colours will absorb the light and make your space feel even smaller than it already is. With these tips, you’ll find that you can make the most of your small space and get every inch of value out of your apartment. The great thing about following these ideas is that they don’t have to cost you a fortune, either, particularly if you opt for a theme such as bohemian, where you can decorate with light, space enhancing colours, and find furniture to match that won’t cost you thousands of dollars by the time you’ve finished. If you are looking to spend a little more to help you update and make the most of a small living space, then NOW FINANCE may be able to help you, via one of our home renovation loans. Get your interest rate now, and put yourself on the path to getting those home renovations you want now, without the need to spend time saving up or dipping into your existing savings. Make your Home look like it came out of the Block – But on a Budget! Whether you’re a fan of The Block or not, the chances are that you know what the show is all about. You might even have looked at the show for inspiration when planning your own home renovations. One potential downfall of looking to The Block for your home renovation ideas is that even the early seasons of the show had a budget of $40,000, while today’s episodes commonly see well over $100,000 spent on renovating each apartment. However, just because you don’t have that sort of money to spend on home renovations, that doesn’t mean you can’t make your property look like it could be on The Block. If you do a great job of renovating your own home on a budget, it also means you’ll make a much bigger profit if you’re planning to sell in the near future. One of the major benefits of owning your own home, after all, is that you can spend a little on home improvements and increase your property value by far more than what you’ve put into it. What should you do to get a home out of The Block on a budget? Here are five ideas for home renovations. Perhaps the biggest thing modern properties have in common is how well-lit they are. The big benefit of having a well-lit property is that it allows you to show off the spaciousness. Even if you have a smaller property, clever use of lighting can make your space seem huge, especially if you have an open plan style space like many of the apartments on The Block do. 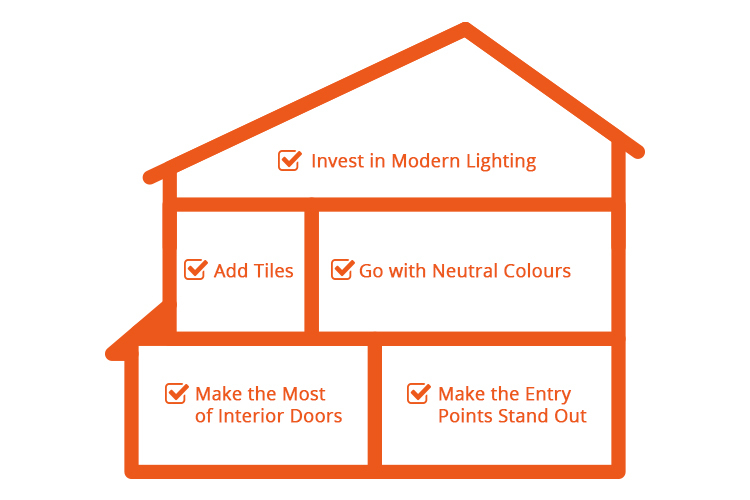 To maximise your use of light, you should invest in modern light fittings. 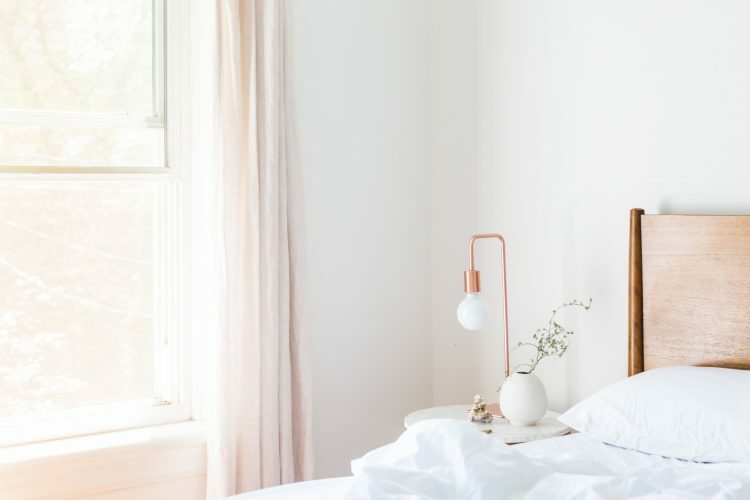 Although older fittings can be quirky and add character to your rooms, they can also make your space look incredibly dated, and often have overbearing elements that don’t allow you to make the most of the light. We all know someone who updates their home décor as often as they update their wardrobe. While this is fun if you don’t mind having painters in your home or you enjoy taking care of the decorating yourself, not only can it be awfully expensive but it’s another way to make your home look dated if you can’t keep on top of it. One thing most modern, stylish properties have in common is that they’re decked out in neutral colours. This doesn’t mean you need to cover your home from top to bottom in magnolia – that’s more boring than neutral. What you should do is go for stylish brown and in particular shades of grey. From a decorating perspective these will make your space look modern as well as bringing a calming feel to your rooms, while allowing you to introduce brighter colours through furniture or tasteful accessories if you wish to. Tiles are common in kitchens and bathrooms, while many who don’t have them in these rooms often think installing tiling would be expensive. However, tiling today is an affordable option thanks to even the cheapest tiles looking stylish and classy. Best of all, it’s very easy to tile yourself, so you won’t have the costs of paying someone to come into your home to do it for you, either. We know that open plan spaces aren’t for everyone, which means you should make the most of interior doors. The biggest problem your interior doors are likely to cause you is that they’re bulky and solid, and thus if you keep them closed they’ll stop the flow of light through your property. Depending on your own preferences you’ll need to make a judgement call on this one, because if you have solid doors that you keep open to let the light through, this can make your home look messy. If you don’t want solid interior doors, what are your options? Traditional interior doors with glass. You can choose how much glass but if you want to maximise the natural light in your home you really need to go top to bottom with your glass fittings. Sliding pocket doors, either solid or with fitted glass. These might cost a little more to install as you’ll need to make the space and fit the sliding mechanisms into the wall, but are a great feature, especially if you’re looking to sell up for a profit in the near future. The benefit of sliding pocket doors is you can have them open for an open space feel whenever you want, and close them when you don’t, so you get the best of both worlds if you can make your budget stretch a little further. Remove the doors completely and opt for an archway. Your only consideration here is that you need to make the archway look part of the room, and create a one larger room feeling. It’s easy to do this and then have the room feel incomplete, like you’ve just taken the doors off and not finished the job. Whatever option you choose, having a great looking interior door set-up doesn’t have to cost a fortune but can add a lot of value to your home. While The Block focuses on apartments, the apartment blocks themselves often look great from the outside with statement entranceways. When updating and renovating their homes, many people don’t consider the impact of updating the exterior. If you live in a house, even cleaning the exterior brickwork can make a massive difference to the appearance and the value of your home, as can tidying up the front garden and making flowerbeds and lawns look attractive. Those are all fairly simple, budget friendly options, too. Should you have a little more budget to play with, then on top of doing these things, look at how you can make the entry points of your home stand out. For the front this may mean you do something as simple as having a covered entrance way, though you could go as far as installing a terrace if you wanted to go further. For the rear of your home, decking and awning isn’t the budget busting project many people would have you believe, and in the summer almost acts as an additional room for your home. As you can see, you don’t necessarily need to spend tens of thousands of dollars to make your property look expensive. All the projects we have mentioned are achievable on small budgets, though you will naturally need to spend a little more if you want to do several of them to really take your home to the next level in terms of appearance and value. If you are looking to spend a little more on your home renovations, NOW FINANCE may be able to help you out with a home renovation loan. This means you don’t have to dip into your own savings or wait until you’ve saved a specific amount of cash; you can undertake the home renovations you want now, and pay back your loan over the next 18 months to 84 months while enjoying the improved lifestyle your renovations will bring as well as the feeling of living in a higher value property. Get your interest rate here prior to applying, and learn how NOW FINANCE can help you make your home look like it’s been featured on The Block. It is common for one generation to blame a previous generation when discussing finances, or living or housing costs. Perhaps blame is even too strong a word. Maybe it is more correct to say that the Gen Y generation, or Millennials, look back enviously at previous generations. In particular this is often driven by the housing market. Millennials’ parents or grandparents often own their own homes, while for some members of Gen Y today the Australian dream and specifically home ownership has been written off entirely. Before we look at the main differences, let’s look at some of the reasons why these differences may have occurred. Instead of downsizing when their children leave home or as they approach retirement age, increasing numbers of Australians are continuing to live in their family homes. They undertake home renovations to ensure their home meets their needs as they age. From their personal perspective this is great for them, however what it does mean is that the supply of housing today is lower than it would have been in the past when we would expect ageing generations to sell up and downsize. In turn, this trend pushes up the prices of property due to the dynamics of supply and demand, thus leaving some millennials feeling like home ownership is always out of reach. Not only are Australians staying in their own homes for longer, in many cases they stay there until the end of their lives, and they are also living for longer. While our parents dying isn’t ever something we like to think about, it’s a relevant point in this case, as many Australians won’t now inherit anything until they’re approaching 60 and thinking about retirement themselves. For those who, for whatever reason, may be relying on their inheritance to help them become a homeowner – either by moving to live in the family home or by using the cash gained by selling it – this means living a huge portion of their lives renting while perhaps saving before they’re going to be able to buy a home. As a positive, at least people facing this scenario will be able to look forward to an element of security in their retirement. 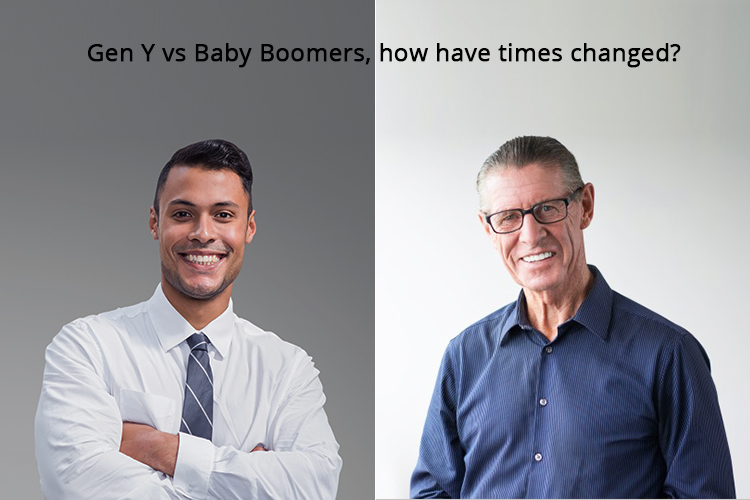 How Does Gen Y Compare with the Baby Boomers? Now that we’ve looked at a couple of the potential underlying reasons that are pushing the trends we’re seeing today, let’s look at how Gen Y and the Baby Boomers compare in terms of some of key economic indicators. In terms of earnings, Gen Y definitely has it better than the Baby Boomers did. The average annual salary for a full-time worker in 1984 was $19,000, which is the equivalent of around $56,000 today. By comparison, the average annual salary for a full-time worker today is $80,000. Is Education Why Salaries are so Much Better? Education, and in particular higher education, is certainly likely to play a part. 1 in 5 Baby Boomers are University educated, compared to 1 in 3 of today’s generation. Numerous studies have been conducted highlighting how a degree can help to inflate an individual’s earning potential, so with a much higher percentage of degree educated individuals in the workforce it is little wonder salaries are much better. 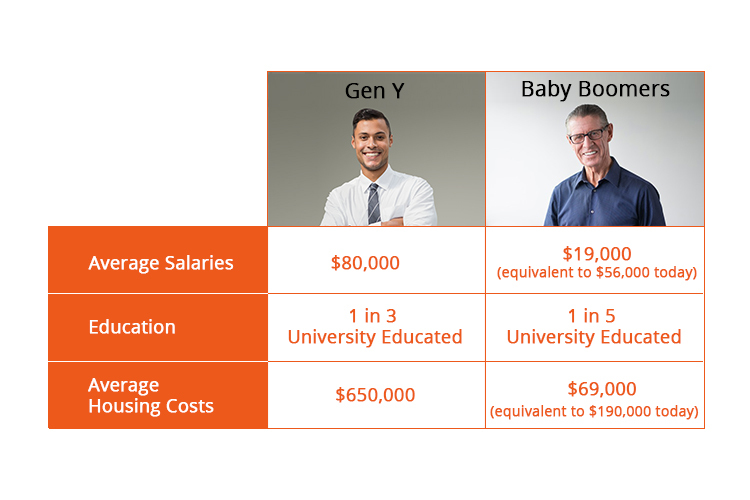 So, Gen Y earn more relative to their Baby Boomer counterparts, and because they are more likely to be educated at a higher level, their lifetime earnings potential is also higher. Why can’t they afford to purchase a home? The average house price in 1984 was $69,000. While it was actually more difficult for Australians to borrow back then, the Baby Boomer generation was much more orientated towards saving than even Gen X were, let alone Gen Y, which meant that even with lower earnings they were still able to buy. While $69,000 in 1984 is worth around $190,000 today, the average house price in Australia today in excess of $650,000 according to Business Insider (March 2017). While salaries have grown, they clearly haven’t grown to the extent that house prices have done. To put this into further contrast, the median property price in Australia today is 13 times average earnings. In 1984, it was just five times average earnings. There’s no question that the Baby Boomers and Gen X have been the biggest beneficiaries of the house price boom. As the Australian economy performed strongly from the early 1990’s to the late 2000’s, these generations benefitted massively from already being in the property market. They already had assets which could grow in value, however those assets have now become a bigger reach for Gen Y, and are likely to be so for future generations, too. How Have Financial Circumstances Changed Gen Y’s Outlook? Although there are many millennials who maintain an ambition to own their own home, many now have no intention of saving in order to try and do so. Instead, they are redefining what the Australian Dream means, taking holidays and enjoying different experiences rather than being driven by the ambition of home ownership. There remains plenty of millennials who do want to own their own home one day, but it remains to be seen whether they will be able to do it without needing a helping hand from wealth inherited in the future. Gurner said it, millennials hit back, Gurner retaliated, and so we go on. It will come as no surprise to anyone who either marvels or despairs at the way the world currently is that most of the response came via social media. Poor avocado! A fruit originally thought to have originated in Mexico but now thought to have been present in Peru as long as 15 years ago, whether you’re looking for advice on healthy fats, superfoods, or the best things to eat to get your daily vitamin intake somewhere near 100% what’s recommended, the chances are that avocado won’t be far away from being mentioned. What did avocado ever do to anyone? Well, nothing, other than probably protect them against heart disease and potentially offend the taste buds of those who don’t like to eat it. The fact avocados can sometimes be expensive – and their popularity continues to see prices rise in various locations around the world – is obviously what got them a mention here. The funniest thing about avocados getting it in the neck here is that they’re just a Starbucks for the modern day. When Starbucks first became big in the United States, it was their fault people had no money, because these folks would buy a coffee every day. At least no brands were mentioned this time, and given the cost of coffee in some places, if anyone knows where you can get great coffee for $4, please get in touch and tell us where! How Dare You Treat Yourself! This is what it boils down to. You simply shouldn’t treat yourself. If you’re not drinking water, and hanging around the supermarket until the groceries that are going out of date are reduced to next to nothing before they are taken off the shelves and thrown in the bin, then you will hardly get a chance of ever becoming a home owner. Live in a decent house or apartment. If you’re renting somewhere nice, what are you thinking about? You ought to be living in the cheapest place available, no matter where it is or the condition of it. Take a vacation. Not only should you not take a vacation, you shouldn’t have any spare time at all. Work. Sleep. Repeat. Have friends. What did having a social life ever do for anyone? Whatever else you’re doing in your life, if it costs money, then it’s not on. You must change your ways now, be born again as a spendthrift, and never get away from the ultimate aim of buying a home. If everything you do isn’t geared towards adding more money to your savings, then it isn’t worth doing. Of course, the notion that you should stop doing anything you enjoy at all just to save money to buy a home is ridiculous. You might even be one of the increasing number of people who is at peace with the idea of never owning a home, and as such it isn’t something you worry about. If home ownership is an ambition you hold, there is obviously some merit in being careful with how you budget so you can save up a mortgage deposit. 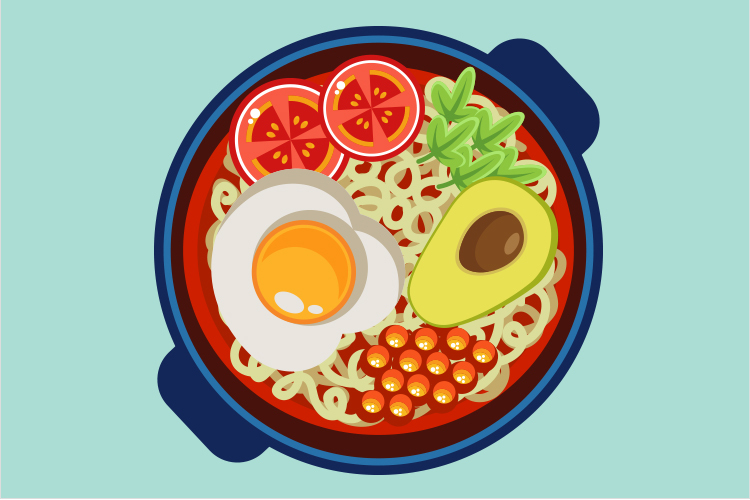 One of the easiest ways to save is to cut back on buying breakfast on the way to work – we’re talking in general here, not just to you blasted avocado toast eaters – coffees, and lunches, a couple of days a week. The beauty of budgeting is that you can plan exactly what you’re going to spend, including on socialising, eating out, and whatever else you like to do. And just because you enjoy the finer things in life from time to time, it doesn’t make you reckless or a non-deserving homeowner, or someone who has no clue how to manage their finances. 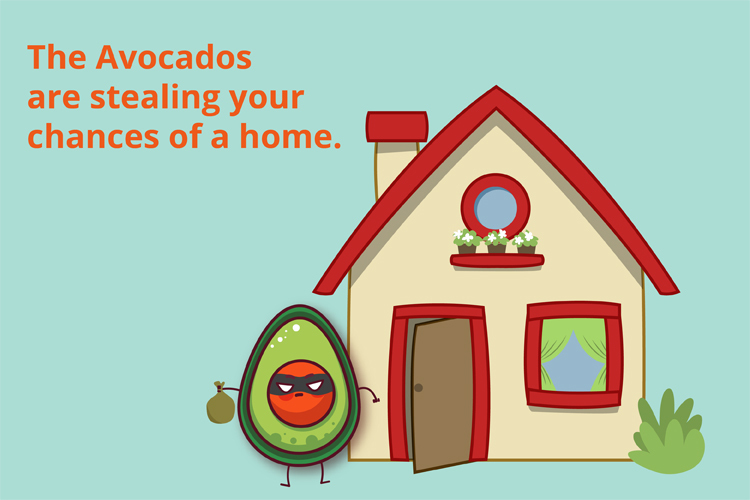 Is avocado toast stopping you owning your own home? Probably not, but there’s never any harm in reconsidering how you spend if you are saving up towards a mortgage deposit. Australia continues to move to a new comprehensive credit reporting (CCR) regime from 1 July 2018, which will be mandatory for the big four banks, and optional for other lenders. This is a significant change in how the big 4 banks and other lenders add and share information with regards to your credit report. Both lenders and consumers should benefit from this change. Lenders will be able to see a more accurate picture of your ability to make repayments and manage your credit, while consumers’ behaviour around these aspects should enable them to have more active influence over whether their future credit enquiries are successful. This change could be hugely positive whether you’re potentially looking at buying your first home in the next few years or may need to take out a loan or another type of credit to meet a different expense. CCR – also called ‘positive reporting’, the reason for which we will go into later – is the process of Australian lenders reporting additional information to Australia’s credit reference bureaus. The credit reference bureaus will then hold this additional information, so it is accessible when lenders need to access your credit report. CCR should allow lenders to build a more comprehensive picture of your credit history, and thus help them to make better, more responsible lending decisions based on your actual behaviour rather than by simply using your credit score. CCR has actually been in place since March 2014, but was only optional for lenders. With initial implementation by Australian lenders low, on 2 November 2017 the government announced CCR would become mandatory for the big four banks from 1 July 2018. CCR is already a mandatory requirement in most of the 34 OECD (Organisational for Economic Cooperation and Development) member countries, bringing Australia in line with these countries. This mandatory change to CCR requires the “Big Four” banks to fully participate in this reporting system. The government has legislated that the major banks must have 50% of their credit data “ready for reporting” by the initial launch date of the 1 July 2018. By 1 July 2019, 100% of this data must be available and be being reported. Under this regime, it would be possible for you to have had a history of late payments and defaults from a few years ago preventing you from accessing credit in the present. While these may still have an impact on whether or not you can get credit, under CCR lenders will also be able to see whether you have been making consistent repayments since that time, and thus may take a different view of your application. What Additional Data Will be on My Credit File? Under CCR, your credit file may now contain information on your repayment history and your personal credit liability. Last two years of repayments for your credit accounts. This will include credit cards, personal loans, your mortgage, and any other type of borrowing. Whether or not you made a payment. Whether the payment was made on time or how late it was made. The final point is significant for consumers. There are likely to be many who pay late in the knowledge that late payments won’t usually be visible on their credit report unless they escalate to a more serious matter. Under CCR, consumers who ensure they pay on time stand to benefit. The types of credit account you have opened, the dates you have opened them and, if relevant, closed them. The name of the credit provider. The current credit limit on the account. What Does This All Mean for Consumers? What does lenders having a more comprehensive picture of your credit file mean for you, in practice? While you are currently entitled as a consumer to ask for incorrect information on your credit file to be corrected, under CCR you have the opportunity to directly influence how lenders view you by ensuring you make repayments on time. CCR could also help young people to build a credit profile quicker, while also making it easier for anyone to recover from adverse credit events. Although some lenders, including NOW FINANCE, long ago moved away from a “one rate for all” model for lending, CCR should ensure all lenders move towards this system to ensure they remain competitive in the consumer finance marketplace. With positive aspects of your consumer credit behaviour being visible on your report, lenders can see that you represent a lower risk, and thus you will be able to access lower interest rates among some lenders. As CCR will make more information available to lenders, this should enable them to make more informed decisions around credit applications. CCR could both lead to more applications being accepted while also reducing outstanding debts, defaults, and other serious credit infringements. Innovative lenders may also use CCR as an opportunity to introduce different types of borrowing or new credit products to consumers. What are the Challenges of CCR? From a consumer perspective, the only real challenge with CCR is to ensure that you’re making your credit repayments on time. If you’re something of a lazy payer then CCR may force you to be more organised if you want to access better credit deals in the future, but if you already make your payments on time you won’t need to change your behaviour, but can potentially look forward to seeing the benefits when you apply for credit in the future. The real challenge of CCR is faced for the government, regulators, and lenders. Ensuring that CCR is implemented correctly, and ensuring the necessary action is taken if it isn’t, is likely to be the biggest issue for the government and regulators. 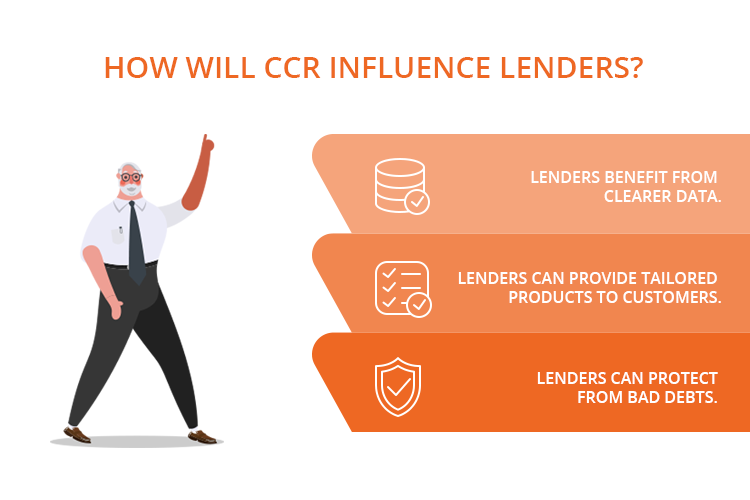 The scale of the challenge presented for lenders by CCR will depend on how they currently operate. Those that have always operated in the “negative reporting” environment and undertook no voluntary implementation of CCR from 2014 to 2018 may find it complex, and expensive, to update their internal systems and processes. Lenders who did opt-in to some or all of the voluntary elements of CCR, as well as those who have been preparing for mandatory CCR for some time, will find it much less challenging. All in all, both lenders and consumers potentially stand to benefit massively from the correct and thorough implementation of CCR. With comprehensive credit reporting (CCR) becoming mandatory for the big four banks in Australia from 1 July 2018, there are a huge number of potential benefits for consumers to take advantage of. As well as there being plenty of benefits on offer, naturally there are some concerns about what CCR may mean for personal privacy and the availability of data, as well as how lenders may use the data in certain circumstances. What are the Benefits of CCR? Overall, CCR is seen as a positive move for consumers. Why? CCR means that the big four banks have to report to credit reference bureaus what payments you have made, and whether you have made them on time. If you are a reliable payer, this will be highlighted on your credit report. Making your payments on time may enable you to access better credit deals, as lenders are more likely to offer you favourable deals if you are seen as a low risk borrower. Under CCR it may be easier to recover from adverse credit events, such as defaults. For example, a default is required to stay on your credit report for a period of five years. However, if you received a default four years ago, and let’s say even that was because you moved out of a house share and forgot to take your name off a subsequently unpaid utility bill, that isn’t necessarily an indicator that you would be unreliable today. Thanks to CCR, lenders would be able to see that since this adverse event you have been making credit repayments on time, and thus be more likely to disregard an old default that isn’t really relevant or representative of your current credit usage. With the current negative reporting system, a default on your credit history will often mean lenders won’t even consider you for credit for those five years. If you are young or have recently moved to Australia, it can be difficult to access credit due to a lack of a credit history. Under negative reporting, it can be difficult to build a credit history due to the sheer lack of information made available. With CCR, you can demonstrate more quickly that you are a reliable payer, which may enable you to access different types of credit and higher amounts of credit more quickly, too. It helps those who are reliable with making their repayments, as lenders will have more visibility of their behaviour. It helps those who have had financial troubles in the past, as lenders can see they have subsequently been reliable and responsible rather than making decisions based on something that happened years ago. These consumers may be able to access credit easier than previously. More and more lenders will follow companies like NOW FINANCE in providing products and offers based on the perceived risk of lending to each specific applicant. CCR means that the information held at credit bureaus will be more complete, and with monthly updates being provided to the bureaus, having a positive credit history and being able to demonstrate responsible financial habits may, in the near future, become an important part of accessing the best deals and higher amounts of credit. What Concerns are there Regarding CCR? There are some concerns around CCR, mainly relating to privacy but also with regards to the availability of credit. With more personal data being reported to Australia’s credit reference bureaus and being made public, it is crucial that all necessary security measures are in place to prevent fraud and consumer identity theft. Could More Transparency Make it Harder to Get Credit? Although it is seen as a positive that CCR will enable lenders to see a lot more information on consumers’ credit use, some fear that it could mean lenders are over-dependent on credit history when making a decision. It is possible, for example, that someone who has lost their job, been seriously ill, or experienced financial difficulty for other reasons through no fault of their own could miss out on credit due to having some recent missed payments on their file. Companies Could Cash In – In More Ways Than One! Some authoritative voices in the finance industry have spoken of concerns that CCR could be an opportunity for companies to cash in, in more ways than one. Consumer Action Law Centre Chief Executive Gerard Brody believes that some lenders may use the presence of negative information within CCR – such as missed or late payments – to provide expensive “priced for risk” products, citing credit cards with APR’s of 50% and the presence of what he called “toxic products” such as these already existing in the United States and in the United Kingdom, which are both countries that already utilise positive reporting. Karen Fox, of the Financial Rights Legal Centre, has spoken of her concerns that “more information means more mistakes” when it comes to credit reports, and anticipates an increase in the number of companies charging consumers for so-called “credit repair” services, which achieve little more than landing the consumer with a bill for thousands of dollars. 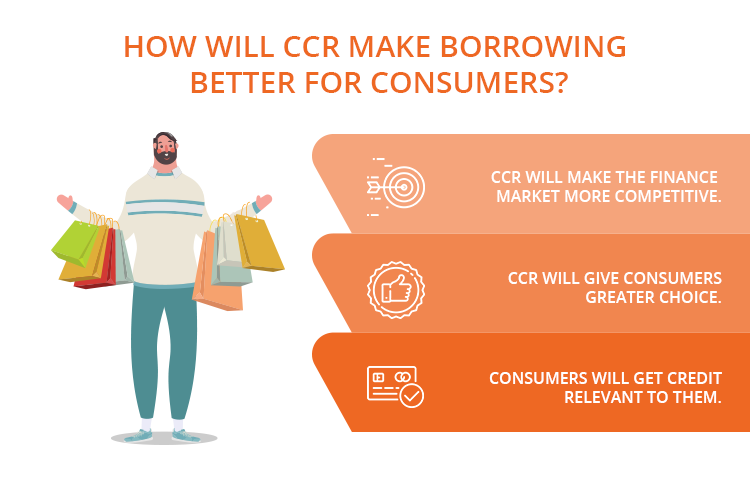 All of the potential concerns raised with CCR are legitimate, however from a consumer perspective, and regarding the things that consumers can control and influence, mandatory CCR should be a highly positive development and one that consumers embrace, in order to give themselves the best chance of accessing the credit they want at the best price, now and in the future. From 1 July 2018, comprehensive credit reporting (CCR), or “positive credit reporting”, will become mandatory in Australia for the big 4 banks. They will require 50% of their consumer data “ready for reporting” by this date, and have until 1 July 2019 to achieve 100% compliance. What is CCR and its Background? CCR means that lenders are obligated to share more of your data with credit reporting bureaus, who in turn will hold that information on your credit file and share it with lenders when you make a credit enquiry. From March 2014 CCR was a voluntary initiative. Banks found switching to CCR complex and expensive, and unnecessary given it was not mandatory. Some banks’ systems were set up for sharing data privately, but not publicly to credit reference bureaus. Banks treated consumer data as an asset in itself; if only your bank knew certain things about your repayment habits, they’d be in a stronger position than anyone to offer you a relevant product or offer based on your circumstances. Research conducted by Experian in the winter of 2017 – before the Australian government announced on 2 November 2017 that CCR was to become mandatory for all – highlighted that 70% of Australians were in favour of CCR, despite only 34% knowing what CCR was and how it worked! 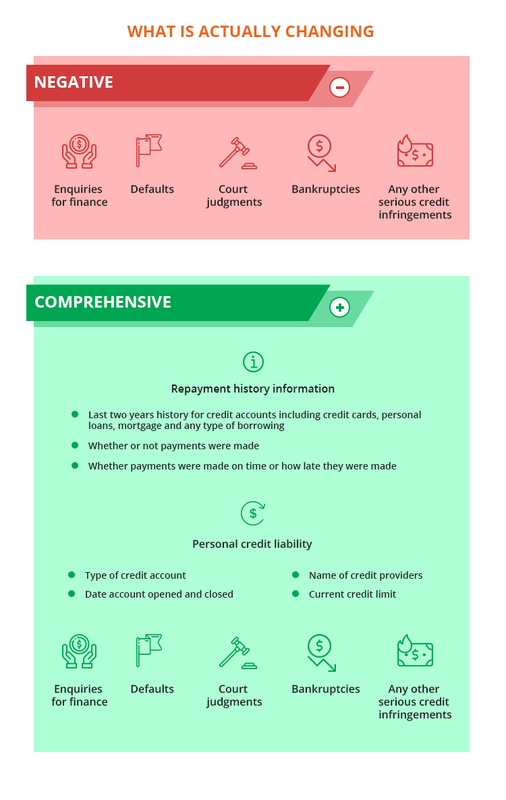 What is Australia’s Current Credit Reporting System? Australia currently operates using a “negative reporting” system. This means that only personal information and negative credit information is held on your credit file. What Information Will Credit Reports Now Include? From 1 July 2018, the big four banks will be required to share much more information with credit reporting bureaus. Specifically, positive information about your consumer credit habits and behaviour will be included. There will be two new sections, for repayment history information and for your personal credit liability. The specific areas that will be included are explored below. Your last two years of repayment history for some of your credit accounts, including your home loan, any personal loans, and any credit cards you have. This will allow prospective lenders to ascertain whether you are likely to be a reliable payer. Whether the payment was made on time. There is a positive aspect to paying on time, as lenders will be able to see this. The dates credit accounts were opened and closed for some of your credit accounts. This will help prospective lenders to get an idea of how much credit you have access to at a given time, how you use credit, and of your potential exposure to debt. You may not have much debt and be a low risk borrower today, but lenders may be wary if you have $10,000 of unutilised credit elsewhere, for example. The different types of credit you have access to. It may be beneficial to be able to demonstrate management of a diverse range of credit products. The names of your credit providers. The current credit limit on your accounts. Again so lenders are able to see your current exposure to debt and assess the potential risk attached to lending to you. If you manage your use of credit carefully this could again help you to be accepted for different credit types, or larger amounts of cash for home or personal loans, in the future. The below table highlights the differences between the current negative reporting regime and CCR. 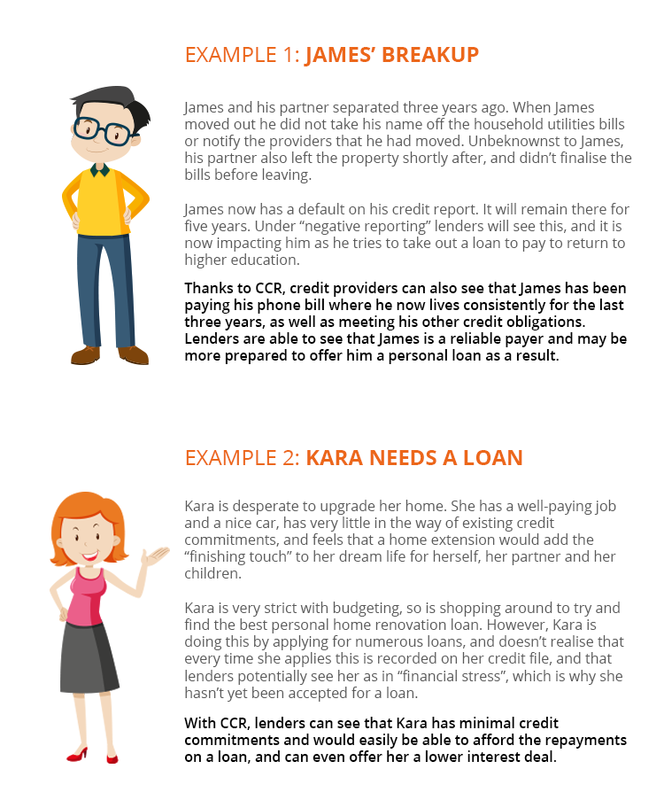 We will now look at a couple of case studies that demonstrate how CCR could help consumers get credit easier. Positive credit reporting, or CCR, is a fantastic opportunity for consumers to ensure their use of credit gives them the best opportunity of being accepted for a loan, credit card, or any other type of credit, the next time they need to apply. Consider how you can change your behaviours and credit usage habits today to potentially improve your chances of being accepted for credit as well as unlocking better, cheaper interest rates and offers in the future. Comprehensive credit reporting (CCR), which from 1 July 2018 will become mandatory for the big four banks, is likely to bring benefits both to lenders and to consumers. How will CCR influence lenders and enable some consumers to potentially access better credit deals than ever before? Under the current “negative reporting” regime, lenders are able to see applicants’ personal information, as well as data relating to credit enquiries, defaults, court judgments, and bankruptcies. One of the shortcomings of the current reporting methods is that when checking an applicant’s credit file, lenders don’t get an accurate picture of consumer behaviour most recently. For many lenders, seeing a default on a credit file may mean they automatically decline a credit application. Yet, if it was one default from four years ago, and since then an applicant has demonstrated exemplary management of credit accounts, that decision may be different. Thanks to CCR, lenders will be able to see this data, allowing them to make better decisions around who they lend to, and potentially mean they can offer credit to applicants who they would have previously declined. 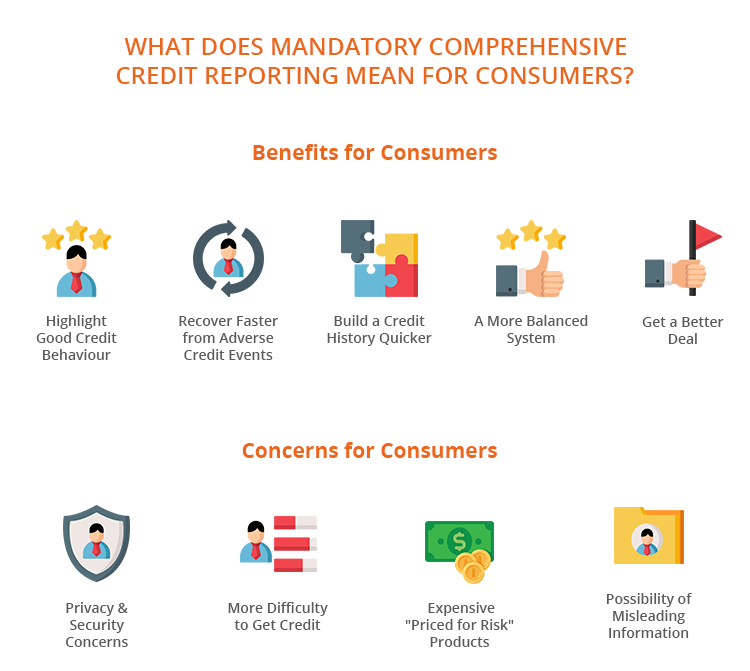 As CCR means credit balances will be visible on a credit report, the new reporting regime will also support responsible lending, as lenders will be able to easier identify potentially high risk borrowers and those with high exposure to debt. One repeated, and often justified, criticism of some lenders in recent years has been that they operate a “one rate for all” policy, sometimes even advertising a low interest rate to hook customers in before then offering a higher one, and using fear, uncertainty, and doubt to get them to take the deal anyway. Under CCR there will be enough information available to lenders to mean that such behaviour on their part won’t be easily justified, although undoubtedly some will still pursue such practices. Where CCR will really make a difference on this front is to those lenders who best understand that each applicant is an individual, and will want to tailor their offer depending on each applicants’ specific set of circumstances. Rather than being able to only see an applicant’s credit score, their personal data, and any negative reporting, lenders will be able to see a comprehensive overview of applicants’ credit usage habits and credit-worthiness. This means lenders can assess risk much better, and give the best deals to those who demonstrate reliability. While lenders will be able to use CCR to their advantage to provide tailored deals to customers, they’ll also be able to use it to protect themselves from lending to high risk individuals. It is possible under the current reporting regime to have a high credit score while experiencing credit stress or over-reliance on credit. While that will still be possible, lenders will now have visibility of the credit commitments of applicants, which will allow them to identify when it might not be responsible to accept a person’s credit application. Both the lender and consumers will benefit here. Lenders are less likely to lose money via defaults, bankruptcies, and bad debts, while consumers are less likely to be able to get another loan or credit card if they are already starting to experience difficulty. How Will CCR Make Borrowing Better for Consumers? As we mentioned above, CCR is going to mean lenders can provide more specific, better tailored deals for consumers. Likewise, from a consumer perspective, the changes that the big banks have to make, and the potential that the smaller banks and other lenders will likely follow suit, better credit deals may be on their way. At present, the big four banks control 80% of Australia’s personal finance market. Now that they have to share much more of their consumer data under CCR, smaller banks and other lenders will be able to become much more competitive. These smaller banks and other lenders will be able to see much more information, make lending decisions using the same data as the big four, and thus by aiming to be competitive will likely drive down interest rates and costs for consumers, as well as potentially leading to new innovations in the personal finance market. The transparency that CCR will bring to the personal finance market means consumers will be able to apply for credit in the knowledge that all lenders can see the same thing. Their bank won’t be holding any credit information that only they are aware of. This means consumers won’t feel beholden to the big four banks when seeking out a new personal loan or a credit card, giving them far more choice in how they shop for credit. CCR is likely to lead to broader access to credit for many Australians. However, the beauty of CCR and the data that will be visible to lenders via your credit file is that consumers can be better matched to the types of credit that would be suitable for them. For example, someone with a default from three years ago may no longer be an automatic “decline” when they make a credit application, but they may be able to borrow a specific amount or be offered specific terms that reflects both that they have had difficulty managing credit in the past and that they have since become a more reliable payer. This links into responsible lending and will work to the benefit of both those who may not currently be able to access credit as well as those who risk becoming overexposed to personal debt. If you know what your credit report says and that it is accurate, as a consumer you are placed in a great position of power once CCR comes into force. You will be able to shop around with more confidence that you are going to be offered a deal that reflects your credit behaviour and usage, and not feel pressured into accepting credit offers when you know you could get a better one elsewhere. From 1 July 2018, Australia’s big four banks must implement comprehensive credit reporting (CCR). In addition to CCR being mandatory for the big four, it is likely that increasing numbers of smaller banks and other lenders will also voluntarily embrace CCR, as some, including NOW FINANCE, have already done so. What is CCR and What is Changing? Your last two years repayment history for most of your credit accounts, including credit cards and personal loans. Account opening and closing dates. What Does This Mean for Me as a Consumer? In short, it means that you are given more control over whether lenders see you as being “credit-worthy” or not. Under the current reporting system, you could find yourself with a “black mark” on your credit file because you missed one payment, or because you got a default a few years ago for something as innocuous as moving house and forgetting to take your name off the utilities accounts. 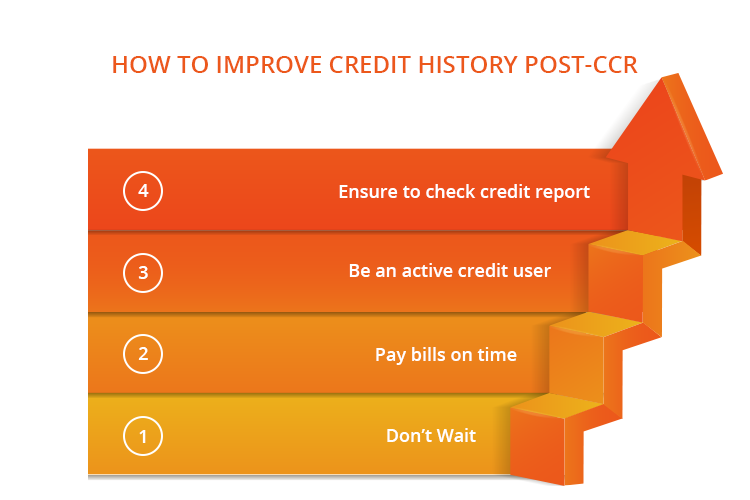 While these are still relevant credit events and will still be looked at by lenders, because CCR means your credit file will show the last two years of repayments, if you’ve kept your accounts up to date and paid your bills when you’re supposed to, you have a better chance of being offered credit even if you do have some adverse history. If you have had more than one adverse credit event in the past, CCR could still be beneficial for you. As the credit referencing bureaus will have far more information available, which will be updated monthly, it will be simpler than ever before to rebuild your credit file with favourable data. Rebuilding your credit file won’t happen overnight, but you will at least have the opportunity to demonstrate good behaviours that in time will make it easier for you to get a better deal when you apply for credit. CCR will also help young people or recent permanent arrivals from overseas to establish a credit history quicker. Under the current negative reporting format, it can be very difficult for consumers who are part of these demographics to acquire credit, or access higher monetary amounts or the best deals, for many years, as it isn’t clear to what extent they are a reliable payer. With the information that will be visible on credit reports post-CCR, there is a much greater opportunity for these consumers to build a credit history and access better deals quicker. How Can I Improve My Credit History Post-CCR? How can you improve your chances of being accepted for credit or accessing better deals post-CCR? The first thing is to ensure you don’t wait until 1 July 2018 to change your behaviour. While CCR is only mandatory for the big four banks, according to Equifax 24% of lenders are currently sharing comprehensive consumer credit data. NOW FINANCE has shared two years’ worth of repayment history information for our customer accounts with credit bureaus, and will be sharing comprehensive reporting shortly. If you’re looking to rebuild your credit history, or simply want to improve your credit file to enable you to access better credit deals, look to do the following. Under the current reporting regime, late payments won’t always appear on your credit file. CCR means your credit file will include payment dates and whether payments were made on time. As a result, ensuring your bills are paid on time is a great way to demonstrate to prospective future lenders that you are likely to be a reliable borrower. If you’re something of a lazy payer and often pay bills a day or two late, get into the habit of paying your bills on time now. Set up direct debits to ensure bills are paid if you haven’t already done so. To be able to demonstrate that you are credit worthy, you need to be an active credit user. Even if you have experienced financial and credit difficulties in the past and only have access to a few hundred dollars on a credit card, use a small portion of your available credit and pay it off in full each month to demonstrate you’re able to manage credit successfully. If you have a default from a couple of years ago, the best way to get lenders to look past this and still consider you for credit is to ensure you are actively using credit and demonstrating reliability, rather than doing nothing at all. With more information going to be present on your credit report than ever before, this also means an increased likelihood that there could be errors in the information. Usually, it will be sufficient for you to check your credit report once a year, which you are entitled to do at no cost, and correct any errors you find. An alternative option is to subscribe to receive activity alerts from a credit reference bureau, so you can check any new information as it is added and quickly resolve any issues should there be potential fraudulent activity and attempts to obtain credit in your name. Follow the tips in this article and take advantage of everything you can do to make yourself more credit-worthy, and able to obtain the best credit deals, in a post-CCR world. Even if you are not a customer of the big four banks, many smaller banks and other credit providers are likely to follow suit with CCR and voluntarily participate, meaning more of your data will be available on your credit file. Although it is only the big four banks who will be subject to mandatory comprehensive credit reporting (CCR) from 1 July 2018, many smaller banks and other lenders already participate, and others are likely to follow suit in the coming months. Depending on whom you bank with and what credit products you currently use, your lenders could already be providing CCR information to Australia’s credit reference bureaus. If they’re not already doing so, you should be prepared for the likelihood that they will do at some point before 1 July 2019, when the big four will have to be providing 100% of the necessary consumer credit data to the credit referencing bureaus. 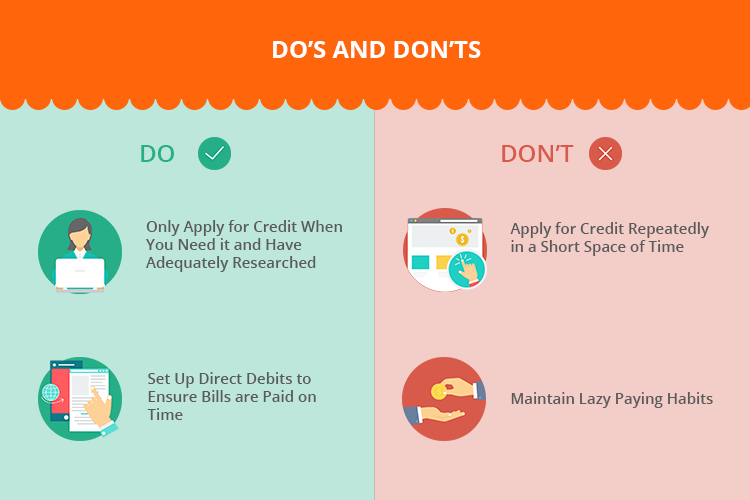 What are the essential do’s and don’ts you should follow to ensure you keep your credit file in the best possible shape, enabling you to access credit when you need to and allowing you to be offered the best possible deals? Although the data that will be visible on your credit report post-CCR means lenders will be able to see if you’re a responsible user of credit, having repeated applications for credit in a short timeframe will remain a warning sign and be interpreted as the applicant experiencing financial or credit distress. Such applicants will be viewed as representing a higher risk; you may find yourself only being offered higher interest rates, or maybe find you can’t get an application accepted at all. One of the biggest changes coming with CCR is that the big four banks, as well as smaller banks and other lenders that may choose to embrace CCR, will have to report whether you make your payments on time. This means that any lenders checking your credit file will see whether you have been a reliable payer over the last two years. Under the previous negative reporting method, late payments might not be recorded at all unless they escalate to a default or other serious credit infringement. At present, if you pay certain bills a few days late you probably aren’t going to see much of an impact on your credit file, and you might not even be bothered by any late payment fees that are applied to your accounts. However, if you’re the type of person who casually pays your credit card bill or personal loan account later than you should, you should kick this habit immediately and start paying on time, as with CCR every late payment will be visible to your prospective lenders. If you can find credit cards with a 0% balance transfer rate, great! Take advantage of these to reduce your debt without paying any interest, but beware of the next “don’t”. It is tempting to switch credit card providers every 12 – 18 months to ensure you are always taking advantage of a promotional rate. However, if you’re only using these promotions to enable you to keep making the minimum repayment and not to make a concerted effort to clear your overall debt, this may have negative consequences for your credit file. If you’re trying to change any more frequently you may also be harming your chances of acquiring credit by applying for credit cards too often. Keeping on top of what your credit file says can be crucial in enabling you to be accepted for credit products at favourable rates. Ensure you check your credit file regularly so you can be sure the information held is correct. If any lenders have reported late payments incorrectly or anything else is not right, contact them to resolve the issue. If you move house, ensure you tell all of your creditors as soon as you can. It may also be worth setting up activity alerts on your credit file so that you are notified when anything changes. CCR means credit reporting bureaus will be updated monthly, and more information may mean a higher likelihood of mistakes occurring, so it is in your interests to manage this closely. Checking your credit file also means reporting any potentially fraudulent entries, such as credit enquiries you haven’t made, which usually indicate someone aiming to acquire credit in your name. It’s easy to fall into the trap of thinking “everything will be fine” when it comes to your credit file. However, for something that takes so little time, it really is worth doing. Being complacent and not checking your credit file will usually mean you discover problems when you want to apply for a bigger loan, maybe even a home loan, and then have to spend time resolving the issues before you can apply again. In worst case scenarios it may mean you even start receiving payment demands for accounts you know nothing about! Don’t invite stress or let your life be held up by something you can check in a few minutes every month. Remember that you are entitled to check your credit file and get your credit score free of charge, too. Use this information as part of your other credit file management activities and use of credit to monitor how your habits impact your credit score. Lenders are more likely to take a softer view of historic defaults if you have paid them. If you have a paid off default from three years ago, but two years of unbroken payment history, always paying on time across various accounts, lenders may still be able to offer you a product. If you have the same default but have made no efforts to clear it, lenders are far less likely to be sympathetic. In much the same way as it is easy to fall into the habit of casually paying your bills a couple of days late, it’s easy to exceed an account limit knowing there isn’t any real consequences save for perhaps a charge of $20 if you don’t bring your account back within the allowed balance within a specified period. This is an easy way to demonstrate that you’re not reliable when it comes to utilising credit or an overdraft facility, so ensure you plan your finances so you never fall foul of this. Don’t allow something relatively simple and innocuous to prevent you accessing better credit rates in the future. Keep these do’s and don’ts in mind, and make any necessary positive changes to your credit usage behaviour now, to ensure you stay on top of CCR and always have a correct, up to date credit file, which accurately represents your credit-worthiness and reliability as a borrower, enabling you to borrow when you need to, and at the best rates available. As comprehensive credit reporting (CCR) becomes mandatory for the big four banks from 1 July 2018, there are potential benefits to be enjoyed by many in Australia. While these potential benefits extend to all, it is possible that prospective borrowers with a thin credit file are going to benefit the most. CCR is a move away from the negative reporting system that most lenders in Australia currently adhere to. CCR has actually been in place since March 2014, but low implementation – 24% of lenders according to Equifax in April 2017 – led to the Australian government mandating in November 2017 that it will become mandatory for the big four banks from July 2018. If repayments were made on time, via your last 24 months payment history. Types of credit accounts held. Opening and closing dates for credit accounts. This means that, for the first time, there will be a potential tangible benefit to those who actively make repayments on time and manage their credit usage carefully, rather than lenders simply seeing that you don’t have late payments or defaults, for example. 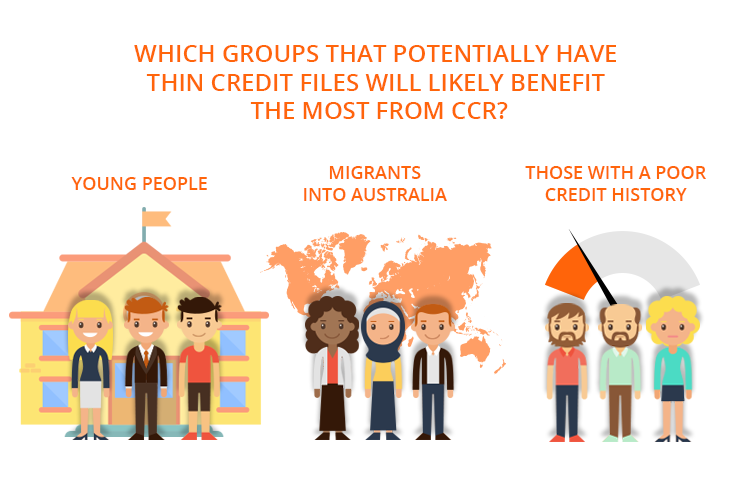 Which groups that potentially have thin credit files will likely benefit the most from CCR? Building up a favourable credit history can be difficult. At present, if you’re between the ages of 18 and 21 – the Good Shepherd Microfinance website extends this to age 24 and terms this group as ‘young millennials’ – it is can be tough to demonstrate you’re a reliable payer with the negative reporting system. While your credit file may show that you don’t have any adverse credit history, lenders don’t know whether you have been exposed to or shown competence at managing credit. With CCR, young people can take out their first personal phone contract, and potentially even a small loan or a credit card with a relatively low credit limit, and build up a history as a responsible borrower, which may enable them to access higher amounts of credit and better deals earlier than they would be able to previously. You can move into Australia from anywhere else in the world, have a near perfect credit history in terms of not having experienced any adverse credit events, have a well-paying job, and still find it difficult to get accepted for credit. As the Australian credit reference bureaus will hold no information about you, lenders aren’t able to make an informed decision as to whether you will prove a reliable borrower. No information equals high risk, so there’s a high chance a credit application would be declined. In a similar manner to young people as described above, CCR will allow migrants into Australia to build up a credit file quicker, thus allowing them to get on with their lives in Australia sooner than otherwise might have been possible. For permanent migrants who may be looking at a home loan, CCR could represent a significant benefit. 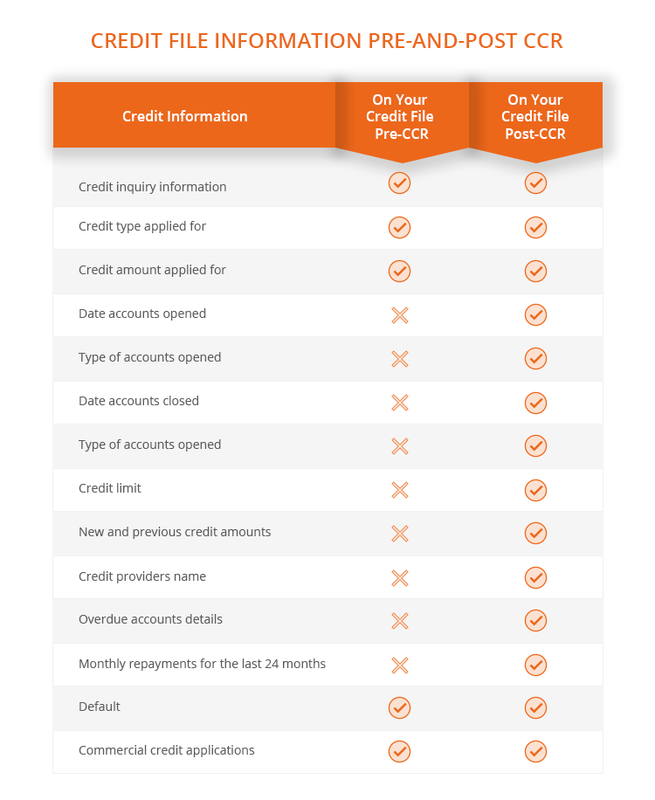 As well as helping individuals who have a thin credit history, CCR could help those who have experienced adverse credit in the past to rebuild their credit history and credit-worthiness. The current negative reporting regime means that if, for example, you have a default on your credit file, many lenders will see that and automatically decline your application. However, with positive reporting, lenders will be able to see if that is a default that is three or four years’ old and has been paid, and if in the last two years you have been reliable in meeting your current credit obligations. CCR could thus prove useful to those who have gotten defaults in the past for reasons they may not be able to control, such as being short of cash if being made redundant or having to take extended time off work due to illness, but are otherwise able to demonstrate they can manage credit responsibly and make payments on time. Why are Some Banks against Comprehensive Credit Reporting? From 1 July 2018, it will be mandatory for the big four banks to provide comprehensive credit reporting (CCR) data. CCR will remain optional for smaller banks and other lenders, as it has been since March 2014. Why are some of the big banks against CCR? CCR was first introduced in March 2014, but was optional for all lenders. Perhaps unsurprisingly, the voluntary element of CCR meant that very few lenders participated, and that only a very small amount of credit accounts were being reported. In April 2017, Equifax revealed that only 24% of lenders were in fact sharing CCR data. This number did not include any of Australia’s big four banks. Consequently, on 2 November 2017, it was announced by the government that CCR would become mandatory for Australia’s big four banks. From 1 July 2018, the big four will have to share 50% of your credit data with credit reporting bureaus. From 1 July 2019, the big four will have to share 100% of your credit data with credit reporting bureaus. Draft legislation published by the government in February 2018 stated that banks will have 90 days from these dates to comply and share the data. In July 2018, the big four will be able to choose which data they provide to comply with the 50% requirement. Although CCR is only becoming mandatory for the big banks from 1 July 2018, many smaller banks and other lenders already provide repayment history information. Those who aren’t already doing so are likely to voluntarily comply with CCR anyway in order to remain competitive in the finance marketplace. Does the Lending Industry In General Support CCR? Yes. Overall, lenders are positive about CCR, and understand the benefits it can bring themselves as well as to their customers. Despite this generally positive outlook, some banks have concerns regarding CCR. Australia currently uses a “negative reporting” credit system. This means that, along with personal information such as your name, current and previous addresses, and your employer’s details, only negative information is placed on your credit file, such as defaults, court judgment, and bankruptcies. As such, the big banks’ internal systems have been built to operate and be effective in this environment. For the big banks, CCR means expensive and complex updates to their systems and processes, so they can share data publicly with the credit reporting bureaus. Some of the big banks, including NAB, already shares data. The big four banks consider the data they hold about their customers to be an asset. Under the current negative reporting regime, the banks have to share relatively little with credit reporting bureaus. This means that while any lender checking a credit application can see information regarding credit enquiries, defaults, and court judgments for the applicant, only the bank currently knows how reliable the person is when it comes to paying on time. This puts the big banks in a position of power as they can curate deals and offers based on what they know about their customers’ behaviour and credit usage habits. The big four control 80% of the personal finance market, so it is in their interests to want to keep the information they will need to report under CCR to themselves. After all, with other lenders able to see that data, they may be able to offer their own unique products and deals and compete more closely with the big banks. Where Does NOW FINANCE Stand on CCR? At NOW FINANCE, we are in favour of CCR, and have already provided credit bureaus with two years of repayment history data for anyone with a NOW FINANCE personal loan account, and will be sharing comprehensive data. NOW FINANCE already provides specific, tailored interest rates based on your credit history and behaviour. The mandatory implementation of CCR for the big four banks, and the likely voluntary implementation by many other lenders, will help us to continue to provide products and offers that are personal to you, and to improve how we do this. Who Will Access my Comprehensive Credit Reporting? 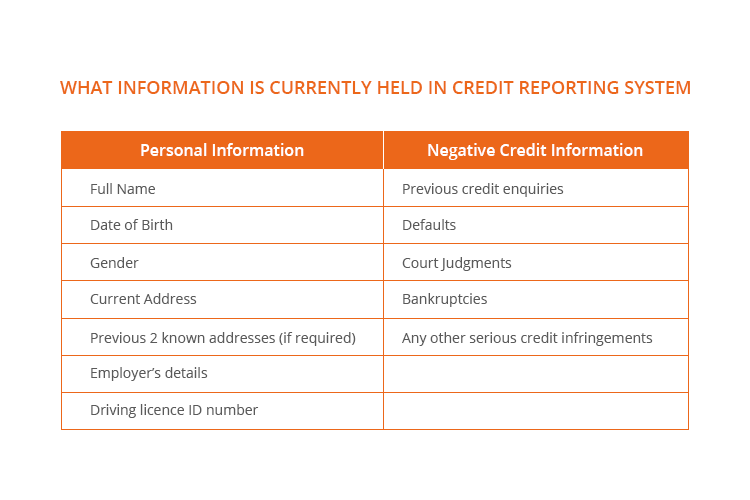 As the big four banks prepare to become compliant with comprehensive credit reporting (CCR) from 1 July 2018, and many smaller banks and other lenders prepare to follow suit voluntarily, many consumers are seeking information as to what information will be available and who will be able to access their credit report. Research released by Experian in 2017 revealed that 70% of Australians were in favour of a move to a more comprehensive credit reporting system, although the same research also revealed that 66% had no idea what CCR was, or even that it had been optional for banks and lenders since March 2014. We have explored what CCR is at length elsewhere across the NOW FINANCE Blog; this article will look at laws around credit reporting to highlight who will access your credit report, and how they may use it. We’ll also include some tips on what you can do to ensure your credit file highlights how reliable a borrower you are. What are the Laws Around Credit Reporting? Who can access and use credit reports. What information can be included on a credit report. How the information contained within a credit report can be used. Consumers should note that the Privacy Act doesn’t just cover what you might consider to be traditional “credit” products like loans and credit cards, but also utilities providers. Separately from the Privacy Act is the Privacy (Credit Reporting) Code, which provides more specific detailed legislation around credit reporting. 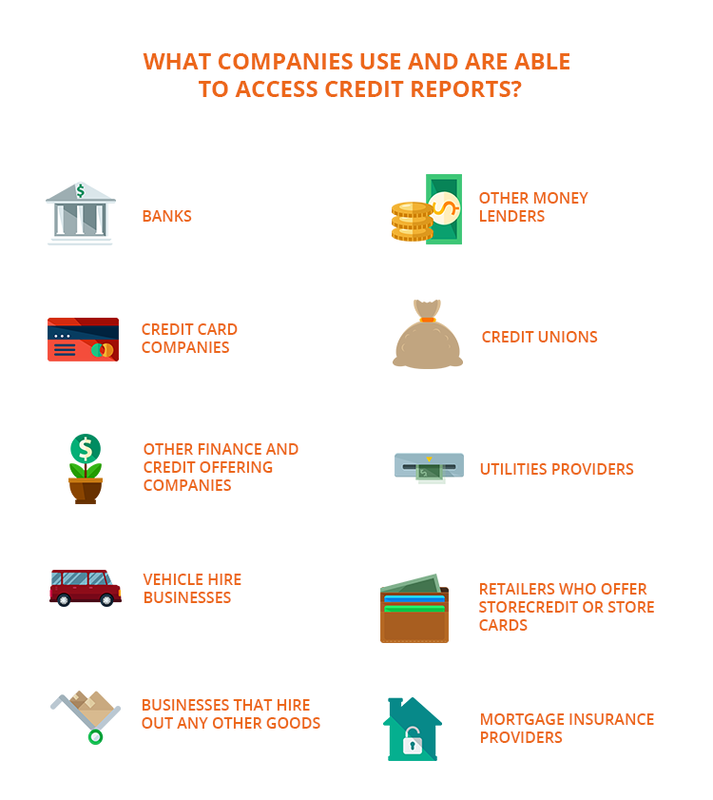 What Companies Use and are Able to Access Credit Reports? Vehicle hire businesses. If you don’t pay some or all of the balance until you return the vehicle, you have been extended a line of credit for the duration of the hire, even if you have paid a deposit. Retailers who offer store credit or store cards, although usually they will offer these facilities through a separate credit provider who would be a traditional lender or finance company. Businesses that hire out any other goods, which may include household white goods, televisions, and musical instruments to give some examples. Credit providers’ agents that manage applications, this could include retail stores as detailed above. As we can see from these points, there is a wide range of businesses that may need to access your credit report and CCR information. How Do Providers Use This Information? If your account falls behind and you stop responding to phone calls and letters, a credit provider may check your file to ascertain they have the correct address. If your creditor believes you may be experiencing financial difficulty, they might look at your credit report so they can help you to avoid defaulting. Helping you in this instance is part of a lenders’ responsible lending obligations. With CCR, companies will be able to see what your credit limits and balances are when checking your credit file prior to making a decision whether to accept or decline. This should enable lenders to make even better responsible lending decisions, reducing defaults, bankruptcies, and bad debts in general. Credit providers are also currently allowed to use your credit report for “internal management purposes,” which may include checking their credit acceptance process or anything else related to their business. Existing lenders could check your credit file if they are preparing to offer you a new product or service to ensure eligibility, although they will already hold your repayment data privately. Under CCR, your repayment information from the big four banks, as well as any other lenders that choose to participate, will be visible in your credit file. Credit providers are allowed to check your credit file, even if you are not an existing customer, to “pre-screen” you to check your eligibility for a product or offer they may be planning to send to you. How Can I Use CCR to My Advantage? By understanding what information credit providers will be able to see on your credit file, you can use CCR to your advantage to increase your chances of both being accepted for credit and of accessing the best deals. Ensure you make payments on time. The current negative reporting system means lenders can only see late payments, defaults, and other credit infringements. CCR means all of your payments for the last two years will be recorded, and paying on time will help to highlight how reliable a borrower you are. Use credit responsibly. With CCR, lenders will be able to see your credit limit and thus your exposure to debt. If you’re using credit cards and holding high balances on these, lenders will be able to see this and may decide you’re too high risk to accept an application for further borrowing. Keep your credit file active. Use small amounts of credit – using your credit card to pay for groceries and paying it off in full each month is a great idea – so that your credit file is active. Close any accounts you don’t use. Check your credit file regularly. You are entitled to see your credit score and credit report at no cost, once every 12 months. You can also subscribe to premium services with the credit referencing bureaus that include year-round access and alerts whenever information is changed or added to your credit reports. Under CCR the big banks will be obliged to update the information monthly, so you will be able to manage and ensure your credit file is correct like never before. Use your knowledge of how lenders will use your credit file post-CCR and how to manage your own credit file to ensure you are always in a position where you will likely be accepted for credit at the best rates available.